Common problems with error messages and simple video issues can be a big headache to PS3 owners. With the use of our PS3 Troubleshooting guides and our comprehensive error message list, many of these problems can be easily identified and resolved. Whether you have switched to a new television and can not get any video, or a system software issue won't let your console boot up, you will most likely find the answer to your problem here. 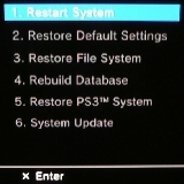 We will show you how to reset video settings, access special system restore menus and how to install new firmware to a system that won't boot along with many other fixes for problems that have caused others to send their consoles in for repair or have turned them into expensive paper weights.